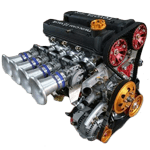 In this section you can find our range of engine parts and accessories, for convenience products that are engine specific have been assigned to categories for their respective engine types. We have started off this section with some unique Australian made parts for the Toyota 4A range of motors made by LouDen Motorsport. Coil on plug plates for the 4AGZE which we haven’t seen in the market before, fuel pressure regulator brackets and custom cam cover plates for those who have gone turbo or twin charge and want their cam covers to reflect that. 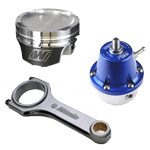 While our main focus in in the auto gauge & wideband areas, we will endeavour to grow these engine parts section over time to offer some more unique parts and accessories. We are also taking a look at importing some genuine parts, such as pistons, total engine gasket kits etc, so stay tuned, pun intended.